You owe it to yourself to come take a look at this Beautiful Open Floorplan Upgraded and well cared for 3 Bedroom (1 used as an office) 2 full Bathrooms Large 2 car attached garage, Elegant Kitchen upgraded Granit counter-tops, Newer flooring throughout, large dining area, master suite has its own full bath, 2 sinks and large vanity, large shower and a walk-in closet. 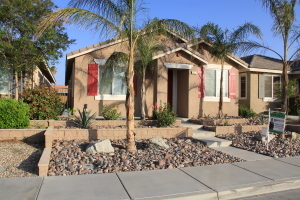 It has a secondary full bathroom, laundry room with cabinets, keep cool and cozy with central A/C and heating, it’s centrally located in San Jacinto’s most desirable area Surrounded by the Majestic San Jacinto Mountains, conveniently located close to shopping, restaurants, schools, parks and entertainment. NO age restrictions, it also has Low Taxes and NO HOA Fees. You Must See This it in Person. Call for a private showing today.